Summary: A specially adapted Wirtgen SP25i concrete slipformer has been used on the M6 motorway near Cannock in the UK. The machine worked together with a Wirtgen ISF25i (independent side feeder) in order to pave a concrete slab under difficult conditions. 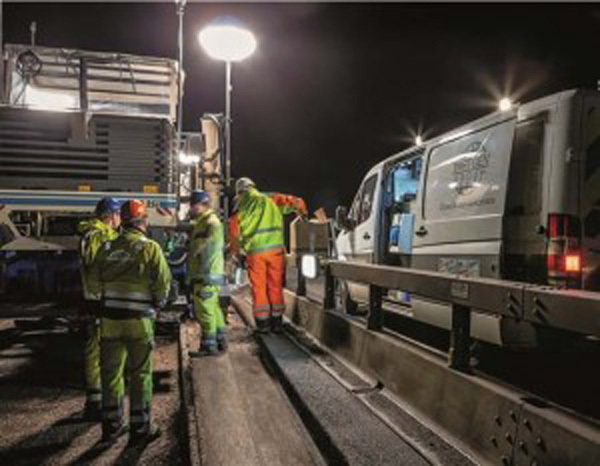 A specially adapted Wirtgen SP25i concrete slipformer has been used on the M6 motorway near Cannock in the UK. The machine worked together with a Wirtgen ISF25i (independent side feeder) in order to pave a concrete slab under difficult conditions. With an overall length of 373km, the M6 is the longest and one of the most heavily congested motorways in the UK. The M6 connects the M1 motorway near Rugby with Carlisle near the Scottish border. But due to the steadily growing volume of traffic, the Highways Agency decided that the service lane was to be upgraded for use as an additional lane between junctions 10a and 13 near Cannock, 25km north of Birmingham. The primary task of the contractor and specialist sub-contractor was to replace the existing reinforced concrete slab with asphalt surfacing on the service lane in order to bring the new traffic lane onto a level with the adjacent pavement and create a homogeneous concrete pavement.